Thanks to all who took the time to leave Thomas a comment. He was so thrilled and it has made his day. Needless to say that will be his topic for show and tell this week. He loves watching on the feed-it map where everyone visits from and is really enjoying photoshop. He is already planning his next items !! The buttons and things are so easy to do if you once you have the fabulous actions from Atomic Cupcake. Her actions are easy to use, fun to play with and have made the transition to digi so much easier. I love that I will never be one letter short for something again. I am slowly trying to ensure that I can either buy or create anything that I loved from my traditional stash before I get rid of it. I loved the metal stuff but used to go crazy at getting it to stick to the page and it added so much weight. So I really LOVE the actions at Atomic Cupcake to do this stuff. 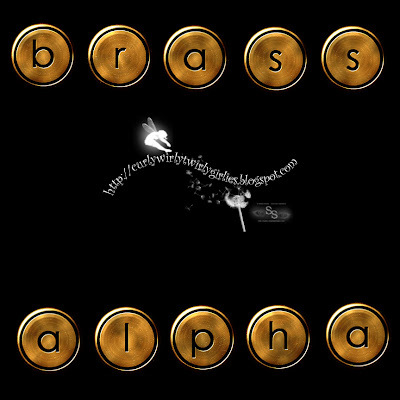 I have just made a little round brass alpha which was a favourite and you can download it here. I think it will go really well with Vicki’s latest kit (About a Boy) or Pam’s Run ABC Kit Please take the time to say hello if you are downloading and let me know what you think. It really is encouraging. Great alpha! Thanks for creating and sharing it. I love the brass alphas which will go with a lot of things, thank you very much.